Non-surgical periodontal therapy removes plaque and calculus by controlling the growth of harmful bacteria and by treating conditions that encourage gum disease. This treatment will help to prevent further loss of bone and gum tissues and the supporting structures of your teeth. 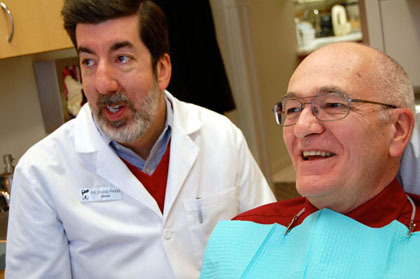 If periodontal disease is caught early, this type of treatment may be all that’s needed. If you have a mild or moderate infection under your gum tissue, root planing and deep scaling may be recommended for you. A routine hygiene visit or cleaning appointment will not treat this problem. Scaling is a type of cleaning that removes plaque and calculus from the teeth and slightly below the gum line. 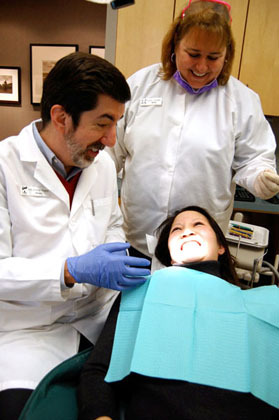 Root planing smoothes root surfaces, so the supportive tissues can better reattach to the tooth surface. Often, this will be done with local anesthesia so you can relax and feel nothing as we rehabilitate your gums. Several theories exist to explain the link between periodontal disease and heart disease. One theory is that oral bacteria can affect the heart when they enter the blood stream, attaching to fatty plaques in the coronary arteries (heart blood vessels) and contributing to clot formation. Coronary artery disease is characterized by a thickening of the walls of the coronary arteries due to the buildup of fatty proteins. Blood clots can obstruct normal blood flow, restricting the amount of nutrients and oxygen available to the heart. This may lead to heart attacks. Another possibility is that the chronic inflammation caused by periodontal disease increases plaque buildup, which may contribute to thickening of the walls of the arteries. Periodontal disease can also exacerbate existing heart conditions. Patients at risk for infective endocarditis may require antibiotics prior to dental procedures. Dr. Paris and your cardiologist will be able to determine if your heart condition requires use of antibiotics prior to dental procedures. 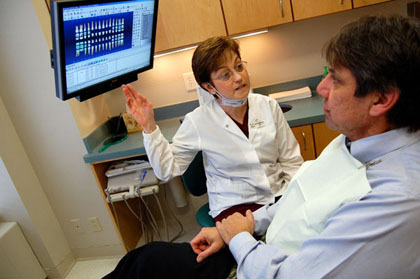 Additional studies have pointed to a relationship between periodontal disease and stroke. In a study that looked at the causal relationship of oral infection as a risk factor for stroke, people diagnosed with acute cerebrovascular ischemia were found more likely to have an oral infection when compared to those in the control group.